Given the clear judicial guidance that now exists on process contracts, this author advances the argument that process contracts are a powerful risk management tool for procuring entities and should be embraced rather than avoided (as has historically been the case). However, from a tenderer’s point of view, challenges remain in identifying meaningful claims or remedies where procuring entities mismanage procurement process. The author considers to what extent the soon to be enacted Government Procurement (Judicial Review) Bill 2017 (Cth) or a claim in estoppel re-balance the competing tensions between a procuring entity’s desire for flexibility and a tenderer’s lust for certainty. 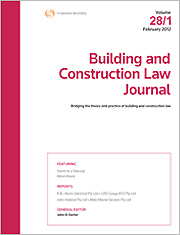 For the PDF version of the table of contents, click here: BCL Vol 33 No 6 Contents.